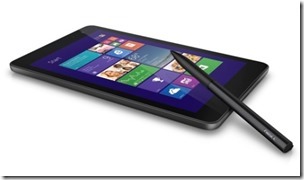 Dell Venue 8 Pro Active Stylus Having Problems? You are here: Home / General / Dell Venue 8 Pro Active Stylus Having Problems? Update: I’ve received my active stylus and tried to use it. Truth be told, it’s pretty useless. Inking in OneNote is passable, but it’s unusable as an aid in navigating the tiny desktop mode. Too often, hover causes unwanted clicks, taps don’t register, and using the stylus causes far more issues than it resolves. Unless Dell fixes it with firmware or updated hardware, I’d eliminate the stylus as a consideration in whether or not to buy the Venue 8 Pro. It looks like the Dell Venue 8 Pro, which I’ve found to be a nice little Windows 8.1 tablet so far, has an Achilles’ heel: a problematic active stylus. Numerous forum postings and a few news pieces tell a story of inaccurate inking, inadvertent clicks caused by the stylus’s hover function, battery drain when the stylus is inactive but within range of the tablet, and other problems. Dell issued a firmware update on 11/20 that was intended to resolve the issues, but it seems like that’s not been enough to make the stylus a fully functional advantage for the Dell Venue 8 Pro. Now, it appears that Dell has perhaps made some hardware changes to the stylus and some folks are reporting better results. I have a stylus on order, and have been delaying my review of the tablet until I’ve had a chance to test it. I just received an email today that my order is delayed, which hopefully means that they have indeed changed the stylus and are creating inventory of the new and improved model. More to come when I receive mine. In the meantime, it seems like one of the best uses of the Dell Venue 8 Pro, precise handwritten notes and drawings (which I miss from my Windows Tablet PC days) remains elusive. I haven’t actually been able to complete the calibration, because the hover-click problem gets in the way. I’ll likely keep trying though.